In a briefing, December 12, 2018, Greg Burke, Director of the Vatican Press Office, reported that three members of the Council of Cardinals (C9) will be leaving the group. Thus, at least for the time being, the C9 has become the C6. The Council of Cardinals met for three days. Participants were Cardinal Oscar Rodriguez Maradiaga, S.D.B. ; H.E. Cardinal Reinhard Marx; Cardinal Sean Patrick O’Malley, O.F.M. Cap. ; Cardinal Giuseppe Bertello; and Cardinal Osvald Gracias were present. The Cardinal Secretary of State, Pietro Parolin, was absent because he represented the Holy See at the Intergovernmental Conference for the formal adoption by UN Member States of the “Global Compact for Migrations,” held in Marrakech, Morocco, on December 10-11. As usual, the Holy Father took part in the works, although he was absent this morning due to the General Audience. 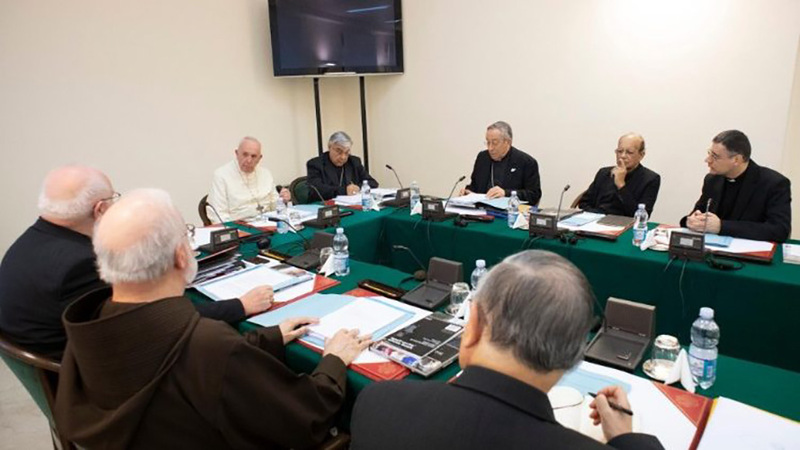 Following the request of the Cardinals, at the end of the 26th Meeting of the Council of Cardinals (September 10-12, 2018), to reflect on the work, the structure and the composition of the Council itself, taking into account the advanced age of some of the members, at the end of October the Holy Father Francis wrote Cardinal George Pell, Cardinal Francisco Javier Errazuriz and Cardinal Laurent Monsengwo Pasinya thanking them for the work they did over these five years. Having considered the Council’s work, at present there is no plan to appoint new members, according to Burke. The Cardinal Counselors addressed several subjects, among them the containment of the Holy See’s costs, the meeting with the Presidents of the Episcopal Conferences of the Catholic Church, on the subject of the “protection of minors,” which will be held in the Vatican from February 21-24, 2019, and the Apostolic Constitution of the Roman Curia. In addition, the Cardinals reflected further on questions regarding the Dicastery for Communication. Monsignor Marco Mellino, appointed last October Assistant Secretary of the Council of Cardinals, to help the Holy Father in governing the universal Church and to study the plan for the revision of the Constitution Pastor Bonus on the Roman Curia, was presented to the Cardinals by Pope Francis. A new proposal of the Apostolic Constitution, whose provisional title is Predicate Evangelium, was given to the Holy Father. Cardinal Marx, Coordinator of the Council for the Economy, addressed the question regarding the reduction of the Holy See’s operating costs. The greatest cost, undoubtedly, is that of the personnel. Confirmed again is that there is no plan or intention to proceed to the licensing of eventual redundancies, but job descriptions must be done to make the work of every Dicastery more efficient, assessing also the possibility of relocations through mobility and, where possible, early retirement. The sense of responsibility calls for multi-year budgets so that the Council for the Economy can formulate 5 to 10-year projections to give a clearer idea of the situation and the way to address it. The Council of Cardinals listened to Dr Paolo Ruffini, who after illustrating the state of advancement of the Reform, which created the Dicastery for Communication, reflected on the next steps to take to lead to its fulfilment in keeping with the Motu Proprio of June 27, 2015, bringing together all the institutions involved and guaranteeing coordinated management and an ever more effective collaboration of resources thanks, as well, to new technological instruments. The Prefect stressed the value of the different means of communication (radio, TV, Web, Social networks) in the present multi-media context and the importance of an integrated synergy between them. Then Dr. Ruffini illustrated the criteria to guarantee a unitary strategy of the Holy See’s communication, emphasizing the unique value of the multi-linguistic offer of the Vatican media. Finally, Professor Vincenzo Bonomo, Rector of the Pontifical Lateran University and Counselor of Vatican City State, informed the Cardinals on the new Laws governing Vatican City State. The next meeting of the Council of Cardinals will take place on February 18, 19 and 20, 2019.